You’ve tested your DNA through Ancestry.com and now you want to send a message to your Ancestry DNA matches through the application’s messaging program. There is one method that many researchers have found is more likely to reach the recipient. Before you reach out, formulate your questions and conduct enough research to conjecture how you might be related to them. Utilizing the “Shared Matches” tool, you may be able to pinpoint whether the match is on your paternal or maternal line. Personalize your message with information that might be helpful to them in their search. 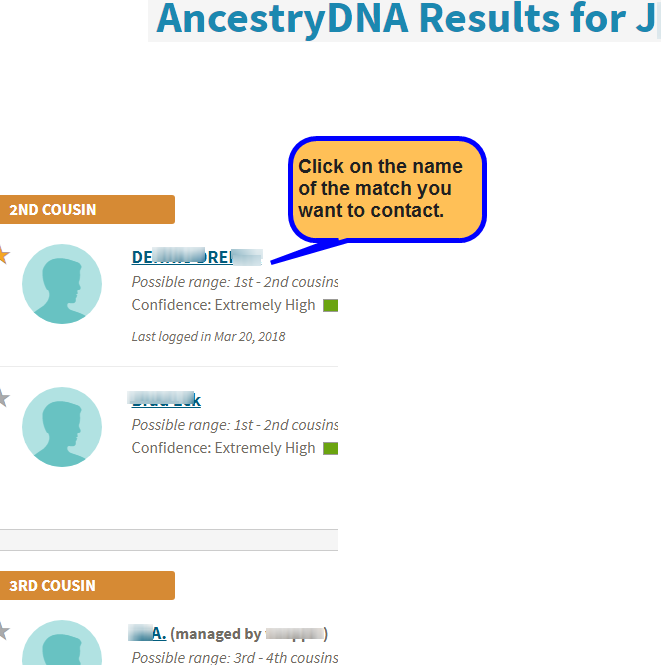 If you have a single name you’re tracing, see if the surname appears in the DNA connections, or if you’ve narrowed the match to the expected shared family line, write to them, regardless. There’s no correct letter. But when someone writes me, I want to know which DNA profile they are asking about. I manage accounts for many people for whom I’m conducting genealogical research. Next, I’m interested in the questions the sender has and what’s prompting them to reach out to me. I once received a friendly but vague note from a possible 4th-6th cousin — a generational distance that doesn’t seem too promising for finding our common ancestor. What intrigued me was her photo. She looked African American and some of my European ancestors were slave owners. Noted that we are a DNA Match and very interested in identifying the link between our families. Any insight you might provide is welcome. I looked at the sender’s tree and noticed that a branch of her family came from a particular region in Virginia where there was a “plantation” that genealogical records associated with my ancestors. I sent her my hypothesis, names in that family and documents that might aide her research. Now, if other DNA participants could do that for each us, it would really advance ones research. 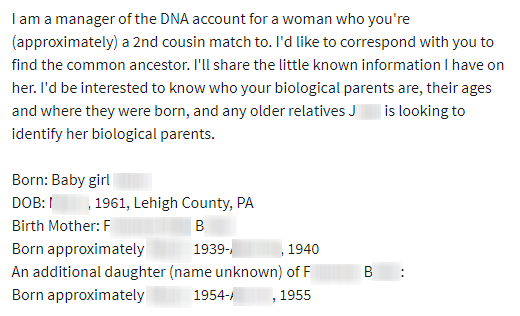 So what are some other scenarios for which you would email a DNA match? I knew only the full birth name of a woman for whom I had little other information, and she was probably born in the 1930’s. She was the birth mother of an adoptee. I isolated one contact who likely was in the maternal line. This was my first contact letter. It was to the point and gave the recipient a specific question I was seeking an answer to. If you’re an adoptee who was born in a state that will release your original birth certificate, you’ll get the full name of your birth mother. But then what? There are a lot of Mary Elizabeth Smiths who were 21 years old in 1960! You still have the challenge of isolating which one is the biological relative. Even if you secure the birth certificate, order your non identifying information record from the adoption agency or the state Social Services. That will contain biographical facts that will prove to be essential in identifying relatives. Again, DNA testing will provide a list of matches. Once you sketch out the profile of your family, look at which matches might be positioned to answer your questions. If the match has no family tree or an incomplete one, let them know that you’d be willing to provide help with their obstacles. Perhaps they or an ancestor was adopted, which will be critical to discover for both of you. Technically, how do you work the Ancestry messaging system to increase the chances that your email will be read? I prefer the desktop application for all my research, but many people are accessing their DNA profile to a limited extent and doing that through a phone or tablet device. The applications for those don’t have the same functionality, including the messaging. I’ll suggest work-arounds in another post. Here’s the best first level approach. Select the name in your DNA results match list of the person you want to contact. Don’t use the green “Send Message” button here. On the next screen, click on their name again. Now you’ll see an orange “Contact” button. That will pop up a window where you can enter your message. Put the tester’s name in the subject line. They may list a full name, initials or a pseudonym. Their profile may be managed by someone else who is the contact for many unrelated accounts, so it’s particularly important to make it easy for the recipient to identify which test you’re referring to.